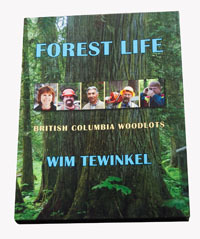 Forest Life: British Columbia Woodlots by Wim Tewinkel showcases and celebrates BC’s woodlots, woodlot licensees and their families. Through beautiful photos and a few words, this book captures the seasonal beauty of coastal and interior woodlots and portrays the landscapes and diversity of our forests as well as the stewardship of those who manage them. You can order it through Paypal for only $39.95.